I am throwing my cousin a baby shower and while on a bike ride I got a vision in my head of how to craft up the invitations. I created the invitations in word, typing the information 2 up on a page (I cropped out the location and RSVP info for the blog post) and printed them out on card stock. I then cut each sheet of paper in half length wise, trimming a bit on the top and bottom so that it would fit into a standard business envelope. To make the baby foot print I put my left hand in a fist, thumb facing towards the sky, and pressed it into an ink pad and stamped it on the page. To make the toes I used my pinky finger. 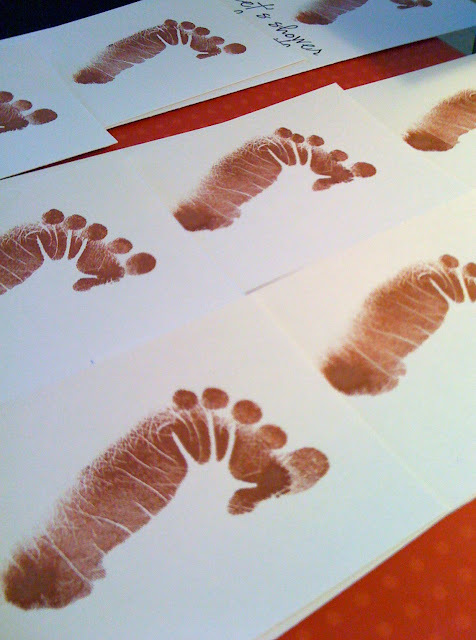 It took a few times to get the foot print just right but once I mastered it the overall process was extremely easy. I loved how they turned out. What font did you use for "Let's shower her with Love?" It's a lovely font! It's Ali Edwards' handwriting font. Here is the link to the free download.